Morning.. Can you believe its May already. I'm really not sure where this year has gone at all. I am working my way through my un-used stamp sets and as we are coming up to exam season I thought this sentiment was perfect! 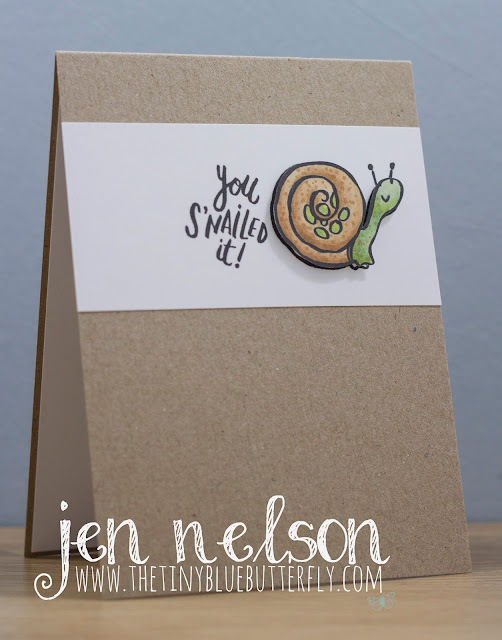 I have used the image and sentiment combo stamp from Stampin Ups Quirky Critters set (retiring). I stamped the image twice, once onto the panel and again onto a scrap of Neenah solar white so I can raise up the body of the snail. I coloured in the one I was fussy cutting out with copic markers and added in some detail, then once cut out the image I mounted it on foam tape and added it onto the panel. The panel is then mounted onto Kraft card stock.